If yer’ gonna ride, know the language. 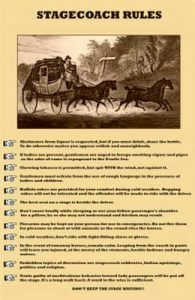 Here’s a few Stagecoach Terms and Slang of the Old West. Boot – A deep luggage carrier at the rear of a stagecoach and also under the driver’s seat. Box – The stage driver’s seat. Bull-Whacker – A driver of a freight wagon, usually with oxen. Carry-all – A light, covered carriage that could hold several people. Celerity Wagon – A stagecoach used in rough country, also referred to as a mud wagon. Charlie – A stagecoach driver. 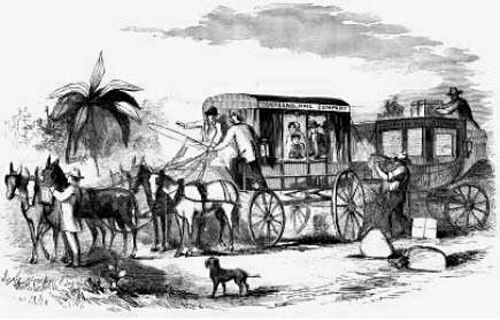 Concord Coach – A stagecoach made by Abbott, Downing Company, in Concord, New Hampshire. Conductor – The person who rode with the driver of a stagecoach and collected fares, took care of passengers, and was responsible for the mail. Corduroy Road – A road created by logs laid across a swampy, low-lying area, placed together or “ribbed” like corduroy cloth. Division – 250 miles of trail belonging to a superintendent on the Overland Route. Division Agent – The person in charge of 250 miles of road on the Overland Route, also called Superintendent. They were in charge of purchasing animals and equipment, maintaining the stations, and hiring station keepers, conductors, hostlers, drivers and blacksmiths. Drag – An object attached to the back of a stagecoach to slow it when going when going downhill. Expressman – A messenger carrying express items. Hame – One of two curved bars fitted to a horse collar, holding the traces of a harness. 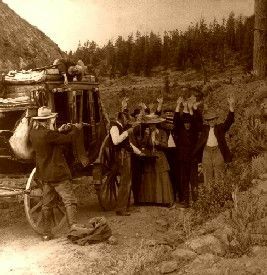 Hangers-on – A phrase used by the more “well-off” riding inside the stagecoach, referring to those who were riding on top. Home Station – A larger station where meals and lodging were provided to passengers. Hostlers – Took care of the horses and mules at the stage stops, as well as changing the team. Jehu – A stagecoach driver, taken from the name of a Biblical character who drove fast and furiously. Johnnycake – A type of cornbread often provided to travelers at stage stops. Leaders – The two front animals of the team. These would be the smallest, smartest and most alert of the team. Near – Referred to the horses or mules on the left side of the team, furthest from the driver. Off – Referred to the horses or mules on the right side of the team, nearest the driver. Overland – Across land rather than by water. Postrider – A person who carried the post, or mail, on horseback. Relay – A team of horses or mules kept in readiness at a way station to relieve the team of an approaching stagecoach. Reaches – Bars that connected the rear axles with forward part of the coach. Reinsman – A stagecoach driver. 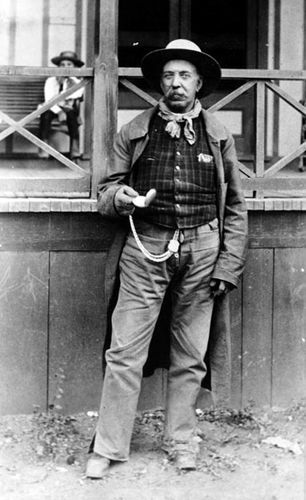 Road Agent – A stagecoach robber. Run – The distance between stage stations. Singletree – A horizontal crossbar, to the ends of which the traces of a harness are attached. 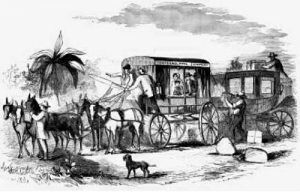 Stageline – A stagecoach company. Stagers – The men who ran or owned the stage business. Staging – The business of carrying people and mail by stagecoach. Station – The place at which a stagecoach stopped. Station Keeper – The person in charge of the station stop. Superintendent – The person in charge of 250 miles of road on the Overland Route, also called Division Agent. Swing Station – A small stage station where the team was changed. Usually consisting of little more than a small cabin and barn or corral, it usually manned by just a few stock-tenders. Stages stopped at Swing Stations for about ten minutes before moving on. Swingers – If a teeam had six animals, the two in the middle were called swingers and were easily controlled by the other two pairs as they did their work leading or stabilizing. Team – The horses or mules pulling the stagecoach, usually consisting of four to six animals. Thorough Brace – A leather strap of many layers that supported the body of the stagecoach. Traces – The side straps by which a horse pulls the stagecoach. Way Station – Same as a station. Waybills – Stage line advertisements posted in towns and villages. Wheelers – The two animals at the rear of the team. These would be the largest and strongest animals to provide stability nearest the coach. Wheelwright – A person who makes of fixes wheels. 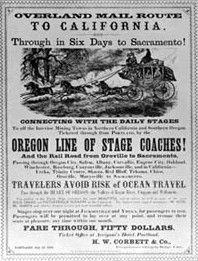 Stagecoach Rules Poster, available at Legends’ General Store. Whippletree – The horizontal bar at the front of the stagecoach, to which singletrees are attached. © Kathy Weiser/Legends of America, updated March, 2012.